Prime Minister Lee Hsien Loong called on the new generation of Singaporeans to renew the country in an age of disruption while holding fast to the values that have made it successful. The Pioneer Generation built modern Singapore from scratch, he noted. And succeeding generations weathered many crises to bring it to First World status. Now, he wants the new generation "to open a new chapter, to create new possibilities and frontiers for our country". He made the call at the annual May Day Rally attended by 1,600 unionists, workers, employers and Cabinet ministers. In striving for a new future, he said, Singaporeans must keep faith with the country's trademark values: the instinct to plan ahead; the drive to do better; the sense of mission; and the duty of stewardship. "This shared responsibility, this shared sense of mission, is our strength. "It is how we will show others - and show ourselves too - that Singapore will always have what it takes to endure and to succeed," he added, while highlighting what lies ahead for the economy and how the country is responding to technological disruption. Last year, improved productivity helped the economy grow a better-than-expected 3.6 per cent, he said. There is a good chance it will grow by more than 2.5 per cent this year if the momentum of economic restructuring is sustained. Growth this year is forecast to be between 1.5 and 3.5 per cent. But hitting this target also hinges on the external environment, which is clouded by tensions, said Mr Lee. He emphasised again a theme of speeches he had made at various international meetings in the past weeks: the importance of free trade and investments. This is being threatened by the strained trade relations between the United States and China, sparking fears of a trade war, which could escalate into a more serious row if countries are forced to take sides, he added. After the US unilaterally imposed tariffs on US$50 billion (S$66 billion) worth of Chinese goods, "the Chinese, politely but firmly, said they do not want a fight", said PM Lee. But if there is a fight, they will take on the US "every step of the way, to the bitter end", he added, saying Singapore would surely suffer collateral damage in such a situation. He warned unambiguously that what is at stake is not just trade, but war and peace.But as the dark clouds on the horizon will take time to reach us, Singapore's economy will be all right this year as long as efforts to strengthen it continue. The labour movement plays a critical role in the journey of change, he said, describing how disruptive technology has brought radical changes. Technology has improved people's lives, he stressed. Referring to online shopping, he said: "My children do it a lot, and once in a while I do it too, with some help from them!" But citing industries, including transport and retail, he talked about how ride-sharing apps have disrupted the taxi industry and how online shopping has hit retail shops, giving examples of older workers who have had to retrain. He pledged to workers to "walk with you and support you all the way". It is the reason fourth-generation political leaders are sent to the labour union to renew tripartism, he said to applause. Labour chief Chan Chun Sing, who has taken over as Minister for Trade and Industry, is being succeeded by Minister Ng Chee Meng, who is NTUC's deputy secretary-general. Senior Minister of State for Trade and Industry Koh Poh Koon has also joined NTUC to help drive the transformation of industries. Describing these changes as part of Singapore's leadership transition, Mr Lee called on the political and NTUC leaders to renew the unique tripartite relationship that underpins the country's success. "Tripartism... is one crucial ingredient that is unique to our success that others cannot copy," he said. "People can see it but they cannot do it. I think that is the best kind of secret." As the Government is undergoing a leadership transition, so too is the labour movement, said Prime Minister Lee Hsien Loong. And younger leaders on both sides must renew mutual trust and their commitment to tripartism, the "secret ingredient" to Singapore's survival and success, he added. 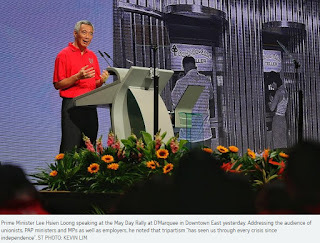 Tripartism - the collaboration between the Government, unions and employers - "has seen us through every crisis since independence", said Mr Lee in his May Day Rally speech yesterday. "We built this together," he told the audience of unionists, People's Action Party (PAP) ministers and MPs, and employers. Mr Lee, who took the stage after National Trades Union Congress secretary-general Chan Chun Sing, said he was very happy to see him introduce NTUC's two new deputy secretaries-general, Mr Ng Chee Meng and Dr Koh Poh Koon, to the crowd and let them speak of their hopes and plans for the labour movement. Mr Ng is expected to take over Mr Chan's role as secretary-general in the coming months, as Mr Chan will be leaving NTUC to focus on his new role as Trade and Industry Minister. "I think it is the right way for the labour movement to go. It is the right way for Singapore to go. One of these days, I will do the same like Brother Chun Sing," quipped Mr Lee, alluding to his own plans to step down as prime minister by the time he reaches 70 in 2022. There are now 18 fourth-generation PAP leaders involved in the labour movement in various roles such as union advisers. Their participation gathered pace following Mr Lee's call last November for the "symbiotic relationship" between the ruling party and the labour movement to be strengthened. This came after some younger union leaders raised questions about whether the relationship, forged from 1954 when the PAP was founded, is necessary. 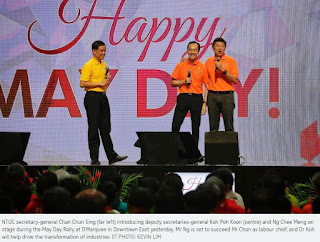 4G PAP leaders and young unionists said yesterday they will look for ways to strengthen the 64-year-old partnership, especially in helping workers upgrade to stay relevant. Newly appointed Manpower Minister Josephine Teo said a priority is to strengthen the Government's connection with the labour movement. 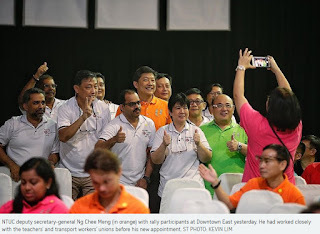 "As a political party, PAP counts on NTUC to be the bridge to working Singaporeans, to understand deeply their concerns and identify the means by which their lives can improve," she told The Straits Times. "The NTUC continues to need the PAP in Government to bring about economic transformation and improve the livelihoods of our people and their families." At the same time, both will need to support businesses to bring people along this journey, she added. Dr Janil Puthucheary, Senior Minister of State for Transport and Communications and Information, said strengthening the tripartite relationship has to involve two key things - talking and doing. "It's about having dialogues - what are their concerns and fears, what are our viewpoints with respect to our policy and directions. But it comes down to doing things together." Dr Janil, an adviser to the U Associate Leaders' Circle, a group of leaders from professional associations, said both sides are, for example, co-organising training events for education and career counsellors to guide students on freelance work. Building Construction and Timber Industries Employees' Union assistant general treasurer Noor Irdawaty Jammarudin, 35, said renewing trust between the Government and labour movement boils down to "more workgroups, more partnerships, doing more things together, to build on what our predecessors have done, especially to help workers adapt to disruptive technology". Air-Transport Executive Staff Union president Daniel Loh, 39, said his role as a young union leader is to be an effective liaison to support the aspirations and address concerns of the current generation of workers. "For this generation, their concerns are about putting food on the table, while pursuing work-life balance. So we need to ensure that there continue to be good jobs - and good jobs don't necessarily mean jobs with good pay," he said. "A good job is one where I am able to fulfil a challenging role effectively and efficiently, do something I like, and where I can practise lifelong learning." Three big disruptions facing the labour movement were outlined at yesterday's May Day Rally - each closer to home than the previous, but all with great potential to complicate the worker's situation. The first is the ongoing trade skirmish between the United States and China, which, if not handled carefully by the two giants, could intensify into a full-scale trade war affecting Singapore. In his 47-minute speech, Prime Minister Lee Hsien Loong took it a step further: If not treated with care, it can escalate into actual conflict. "What is at stake is not just prosperity, but war and peace," he warned. This is not a far-fetched idea. One underlying cause of World War II - there were many causes, but this was at least a contributory factor - was the Great Depression, which, in turn, stemmed in part from a trade war among developed nations beginning with the protectionist Smoot-Hawley Tariff. But even before it comes to war, workers' livelihoods could have taken a lot of damage. Mr Lee noted how Singapore could end up a loser. First, products from Singapore get dragged into the fray when the two sides slap tariffs on each other. Second, if the rules-based trade system on which Singapore relies is eroded, "small countries like us will be worst hit", he added. If a trade war is external, at least in origin, the second disruption, technology, is nearer to the worker. Many disruptive technologies have already arrived. In transport, for instance, apps such as Grab and Uber are now widely used, changing the way taxi drivers work. Citing such examples, Mr Lee said: "The changes are positive changes. We have to embrace them. We cannot hold it back." The third disruption is closer still to the labour movement. Indeed, it is at the heart of the movement - a change in its top leadership. 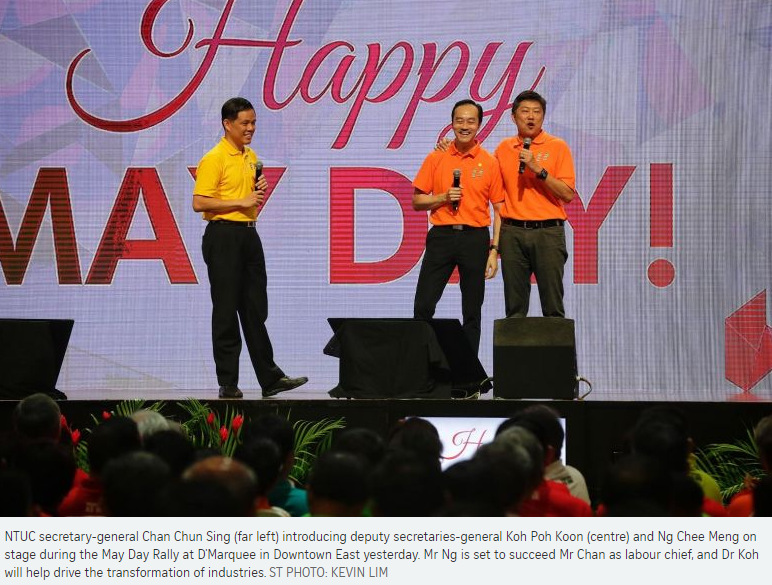 Mr Ng Chee Meng is expected to succeed Mr Chan Chun Sing as labour chief in the coming months. Leadership renewal in the labour movement happens once every several years. This is not a disruption per se. But neither should the challenge involved be underestimated. In 1983, labour chief Lim Chee Onn had to step aside, following an observation by then Prime Minister Lee Kuan Yew that he had failed to establish rapport with rank-and-file union leaders. Such a relationship matters especially since the labour chief has to be elected by union delegates at regular intervals in a secret ballot. It is hence not a foregone conclusion that someone appointed to the role will succeed. Yesterday, by giving notice about the disruptions that workers can and will face, Mr Lee was preparing them mentally for change and encouraging them to take decisive steps to stay relevant. This would include upskilling, but also maintaining a certain hunger and never believing that the world owes workers a living. He also re-emphasised tripartism - a secret fundamental to Singapore's survival and success, he said, adding: "It is not secret in a sense that people do not know about it. It is secret in a sense that people can see it but they cannot do it. That is the best kind of secret." The concluding note about tripartism in Mr Lee's speech is no coincidence. Tripartism is key to overcoming the disruptions. If a trade war or technological change makes the going tough for some businesses, tensions among the three parties - the companies, their workers and the Government - will grow. Tripartism is a way to work through that tension. If there are to be retrenchments or wage negotiations or job redesign, for example, they should be done in accordance with principles all three parties can agree to. Tripartism can also prompt pre-emptive action, without having to wait for a rainy day to arrive. There was an announcement yesterday by Mr Chan that $200 million had been injected into a training fund for workers. The unions worked to raise the money, some of which was donated by companies, with matching sponsorship from the Government. In the case of leadership renewal, tripartism is important too. If it falls apart, then no matter how energetic an incoming labour chief is, he is swimming against the tide. Conversely, if tripartism is deeply ingrained in all sides, and labour relations proceed smoothly, leaders will have an easier task. At first glance, tripartism can seem flawed. The three parties negotiate in a non-confrontational way to obtain a harmonious outcome. But how is this done? After all, labour relations can at times be a zero-sum game. For instance, it is hard to run away from the fact that a pay rise for workers simply means lower profits for shareholders in the short term. Another concern is that when the relationship is seen as skewed towards one of the three parties, another party could lose out. Yet the fact remains: Tripartism has worked for Singapore over the long haul. This is borne out by the ordinary worker's situation. After five decades of independence, the median worker's income grew to six times what it was in 1965 - taking into account inflation. His qualitative standard of living has also changed beyond recognition. At the end of the day, that is the real test for tripartism. He may not have the memorable catchphrases or decades of experience of his predecessor Lim Swee Say, but in his short stint as labour chief, Mr Chan Chun Sing has won over many unionists with his sharp intellect, friendly demeanour and confidence on stage, said those interviewed yesterday. Mr Chan, the National Trades Union Congress' (NTUC) secretary-general for three years, will be leaving in the coming months to focus on his new role as Trade and Industry Minister. Unionist Mohamad Nazir Sani of the Union of Power and Gas Employees said he was struck by Mr Chan's ability to listen to a crowd, taking in views and questions all at once, then distilling them and responding to issues raised - all without notes. "It's a very impressive skill, and really shows what an organised and sharp thinker he is," he said. At the May Day Rally yesterday, Mr Chan gave a 20-minute speech, also without detailed notes, using diagrams and jokes in his message. Several unionists said he is warm and approachable on the ground too. "When he attends events, he rarely eats, he's always just talking to everyone in the room," said Mr Ken Tan, president of the Public Utilities Board Employees' Union. Ms Noor Irdawaty Jammarudin, 35, from the Building Construction and Timber Industries Employees' Union, said Mr Chan's relaxed demeanour allowed even younger unionists like herself to feel comfortable joking around with him. "Mr Lim is someone we really look up to, like a father figure, whom we see more as a teacher or mentor. But Mr Chan is more of a brother and friend." Mr Liaw Chin Chog of the Amalgamated Union of Statutory Board Employees added that Mr Chan has made his mark at NTUC in subtle but important ways. He said: "We used to hold a big ceremony for our annual May Day Awards. Now, we have a much simpler affair, because he said it's very important for NTUC to be a good steward of finances." More importantly, said all the unionists interviewed, Mr Chan's legacy will be the suite of training initiatives he pushed for, to encourage workers to upgrade their skills. They include the Union Training Assistance Programme to defray training costs for union members, and the Career Activation Programme, which supports unemployed professionals, managers and executives. Mr Liaw said: "He really put in a lot of effort to push this message of how important it is for workers to retrain and reskill. That is his legacy." Minutes before they marched into the conference hall, flag bearers from various unions were teasingly prodded by Mr Ng Chee Meng with the command: "Chests out, stomachs in!" The men and women laughed - and stiffened their backs. The little byplay called to mind Mr Ng's background as chief of defence force prior to entering politics in 2015. At his first May Day Rally as a labour leader - he was unveiled as NTUC deputy secretary-general last week - the former military man made a clear effort to get up close and personal with the troops. Togged out in a bright orange NTUC polo shirt, Mr Ng posed for wefies when he arrived at the rally at Downtown East and struck up small talk with unionists before being introduced to over 1,600 people in the labour movement by NTUC secretary-general Chan Chun Sing. In a short speech, Mr Ng promised to listen to workers to better address their needs. "I'll like to walk the ground with you, hear your views and chart a clear direction forward," he told them. The 49-year-old confirmed that he had discussed a timeline with Mr Chan, who has become Minister for Trade and Industry, for assuming the mantle. "I look forward to the time when I will take over, and when that time comes I will inform all of you," he said. Prime Minister Lee Hsien Loong said yesterday that Mr Ng, formerly Education Minister for Schools and Second Minister for Transport, has worked closely with the teachers' and transport workers' unions. "I am confident that he will build on Chun Sing's good work and lead NTUC well and... take the labour movement to greater heights." Unionists yesterday said Mr Ng is not yet a familiar face, but they are hopeful he will be well placed to champion their cause. Mr Mohamed Rafi Mohamed, a Singapore Refining Company Employees' Union executive council member, said: "I've not met Mr Ng yet, but he strikes me as someone who will show solidarity with the people, and who will want to connect with you on a personal level." Mr Fang Chin Poh, general secretary of the National Transport Workers' Union, added: "He is young and personable, and is empathetic when he listens to our concerns about issues such as having to meet higher service standards under the new bus contracting model." 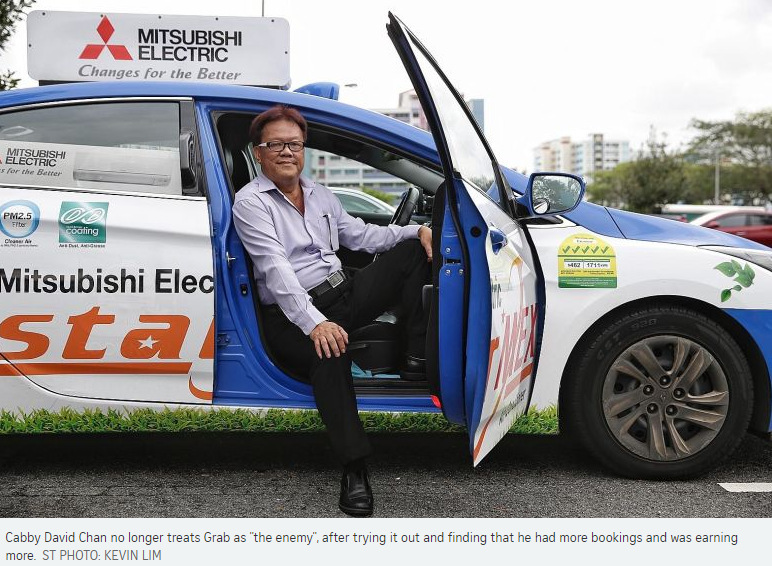 ComfortDelGro cabby David Chan was resentful when ride-hailing companies Uber and Grab entered Singapore's public transport scene. The 58-year-old "thought they were the enemy, stealing the customers", Prime Minister Lee Hsien Loong related at a May Day Rally yesterday. But last September, Mr Chan tried out Grab after a friend referred him to it. Almost immediately, he found he had more bookings and was earning more. "I was scared at first because about 90 per cent of Grab passengers pay their fare using GrabPay instead of cash, so I was really worried I would never see the money," Mr Chan told The Straits Times, referring to the cashless payment option on the app. "But I realised my earnings were transferred straight to my bank account within 24 hours." He has since embraced the concept of cashless payments, paying his daily taxi rental through mobile banking instead of queueing to do it in person. He also helps other drivers keen to learn how to use the Grab app. Mr Chan, PM Lee said, shows "you are never too old to learn to use technology". His story also shows how well cabbies have adapted to disruption in their industry, and that workers in other sectors facing rapid technological changes should embrace change too, Mr Lee added. "I know when ride-sharing first came, taxi drivers had grumbles, but in truth they generally have adapted quite well to the market changes," he said. With the impending arrival of driverless vehicles, bus and train captains will have to take the cue from taxi drivers, he added. But they will not be displaced completely because the automated vehicles will need someone to monitor what is happening and ensure the computer does not make a mistake, Mr Lee said. Companies too have to transform, he said, citing DIY chain Home-Fix, which started as a charcoal shop in Geylang Serai in the 1960s. Its managing director Low Cheong Kee took over the family business in 1993 and modernised it. But as online shopping grew in popularity, Mr Low's business took a hit and he closed 10 retail stores in Singapore, leaving him with 16. Now, he has an online platform to sell his products. He also transformed his business model to offer more services. It is no longer just DIY, but DIFY (do-it-for-you), with someone sent to do the repairs for you. There is also DIWY (do-it-with-you), in which customers are taught to repair appliances and fix up their homes. "In that way, he is building new relationships, doing things which online stores will find hard to replicate," said Mr Lee. The fund, which subsidises training for union members, has reached its $200 million target. NTUC raised $50 million through sponsorships and received $150 million in matching government grants. The new union was formed to represent workers in the logistics and supply chain management sector, including 800 employees from ST Logistics. The labour movement is working with unions in the financial cluster to better represent professionals, managers and executives in new services such as financial technology and asset management. The association for information and communications technology professionals will provide key services including networking opportunities and support for training. Under a partnership with United Overseas Bank, NTUC will offer small and medium-sized enterprises (SMEs) a digital solution that helps to automate processes such as accounting and finance. The most basic option will be free. NTUC will offer it's Plus! Engage service for SMEs to market their products and collect data that can be used to improve campaigns. NTUC's social enterprises in the upcoming Kampung Admiralty project will work more closely to offer integrated services. The new housing estate will have a FairPrice supermarket, a Foodfare hawker centre, a First Campus childcare centre and an NTUC Health eldercare service centre. Singapore's economy grew 3.6 per cent last year, and it can look forward to healthy economic growth this year, too, if this momentum is maintained, Prime Minister Lee Hsien Loong said yesterday. Productivity growth last year reached its highest in seven years, and more jobs were created, including higher-paying ones, Mr Lee noted in his annual May Day message to workers. How things shape up this year will depend on the external environment, he said, adding that prospects for the global economy have been clouded by recent trade tensions between the United States and China. In his message, Mr Lee called on Singaporeans to stay united and work together, regardless of domestic or international developments, so that the country is ready for any opportunities or shocks that may come its way. His message comes after the Ministry of Manpower (MOM) said last Friday that while unemployment rates have declined from a year ago, further improvement will be harder to achieve. The resident unemployment rate has dropped to 2.8 per cent in the first quarter of the year, a two-year low, while the seasonally adjusted overall unemployment rate also dipped, from 2.1 per cent in the preceding quarter to 2 per cent for the first quarter of this year. Economists also voiced concern about a contraction in total employment - excluding foreign domestic workers - and echoed MOM's call to address potential job-skill mismatches as the economy presses on with restructuring efforts. On this front, Singapore is making progress when it comes to making its industries and sectors more productive and efficient, said Mr Lee. The Government also provides support and incentives for employers and workers to improve their skills and transform, he said, naming initiatives such as SkillsFuture, which offers subsidies for training. "Employers and workers must do their part too," Mr Lee said, adding that the labour movement has grown in strength and extended its outreach to freelancers, the self-employed, migrant workers and professionals. After three years in the NTUC, National Trades Union Congress secretary-general Chan Chun Sing was asked by PM Lee to return to the Government. He will assume his new portfolio as Minister of Trade and Industry today, while outgoing Education Minister (Schools) Ng Chee Meng, who was named NTUC deputy secretary-general last week, will serve full-time in NTUC from this month. "The labour movement will be a pillar of strength as we brave the challenges and storms, working together to build a dynamic and prosperous Singapore," said Mr Lee, wishing all a happy May Day. He will deliver his annual May Day Rally speech today. Singapore's push to improve productivity has borne fruit, but the gains remain uneven and are not pervasive enough as some sectors of the economy continue to be disrupted, incoming Manpower Minister Josephine Teo said yesterday. In her inaugural May Day message before taking over from Manpower Minister Lim Swee Say tomorrow, she urged tripartite partners - the Government, employers and unions - to press on with helping businesses transform and workers adapt. Sustaining such efforts will be necessary to keep wages growing in the medium to long term, she said, striking a note of cautious optimism. Her call was met with a pledge by the labour movement to press on with helping workers acquire skills that companies need as the economy restructures. The National Trades Union Congress (NTUC) has expanded its network to cover all working people in Singapore to this end, and has also boosted its training offerings, said its leaders Mary Liew and Chan Chun Sing ahead of May Day celebrations tomorrow. The outlook for workers improved last year as Singapore's economy grew by 3.6 per cent, boosted by productivity growth of 4.5 per cent. Full-time Singaporean workers saw their real median income go up by 5.3 per cent during the period, compared to 1.3 per cent the year before. This happened against a backdrop of falling unemployment and fewer retrenchments. But while the statistics are encouraging, economists cautioned that it is still too early to tell if the labour market has turned the corner for good. Singapore National Employers Federation president Robert Yap noted that workforce growth, which ultimately affects the vitality of the economy, is slowing down. Singapore's workforce shrank by 0.3 per cent last year, though it is expected to grow 1 to 2 per cent per year from 2018 to 2020. Both Mrs Teo and Dr Yap spoke of the need for the labour market to evolve, whether in training workers relevant to new industries, providing flexible work arrangements or adopting progressive hiring practices. At the same time, the business climate must remain dynamic to encourage investments in new activities and create new jobs, said Mrs Teo. "To progress as an economy, we must master new technologies, transform quickly and enhance our competitiveness. We must also enable Singaporeans to acquire new skills relevant to industries and businesses of the future," she added. "To progress as a society, we must ensure that everyone - regardless of age, gender and income level - can access better jobs and opportunities to advance." 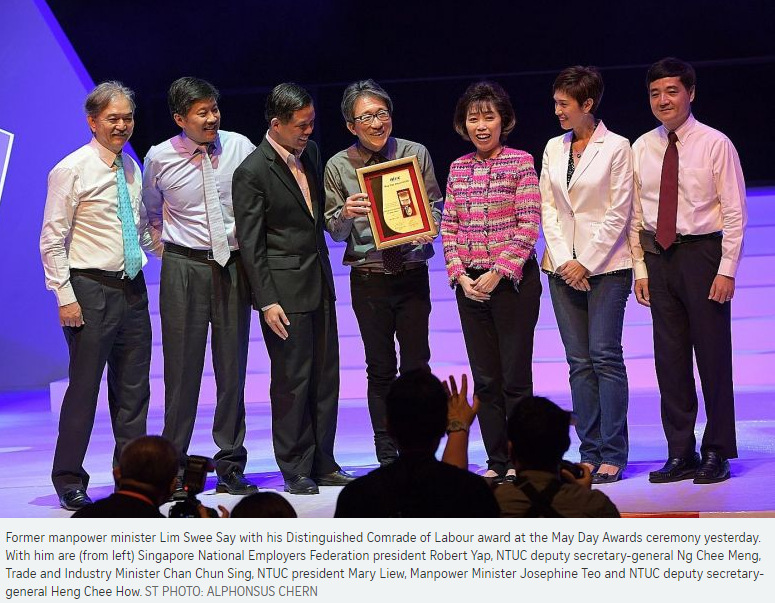 Former manpower minister Lim Swee Say received the labour movement's highest May Day award this year, in recognition of his contributions to improving the lives of Singapore workers during his time in the National Trades Union Congress (NTUC). The Distinguished Comrade of Labour award is conferred upon "individuals who have made unique and supreme contributions to the labour movement". Past recipients of the award include Emeritus Senior Minister Goh Chok Tong in 2001, the late president Ong Teng Cheong in 1994, and the late prime minister Lee Kuan Yew in 1991. Yesterday also marked a homecoming of sorts for Mr Lim, who stepped down as NTUC secretary-general in 2015 to take the helm at the Manpower Ministry. He was appointed as NTUC trustee, chairman of the NTUC Administration and Research Unit's (ARU) trustee board, and adviser to a newly set-up NTUC Training Council, which will focus on career and training opportunities for workers. The announcements were made at the annual May Day Awards ceremony, where 141 organisations and individuals were honoured for their contributions to the labour movement. Mr Lim's time at the labour movement - first from 1996 to 1999, and later from 2004 to 2015 - coincided with two financial crises. A year after he first joined NTUC, the Asian financial crisis hit, displacing workers on a scale never before seen in Singapore, Mr Lim said in an interview with LabourBeat, a blog run by NTUC. Many of the workers who lost their jobs came from the two major industrial unions where Mr Lim was executive secretary, and this experience drove him to push for improved training to help workers stay employable. By the time the global financial crisis happened in 2009, his leadership and strong relationship with the tripartite partners cushioned the impact on workers, said NTUC in its award citation. He persuaded employers to agree to "cut costs to save jobs" and the Government responded with measures to help businesses. NTUC also gave Mr Lim credit for making the labour movement stronger through his "selfless leadership". In his eight years as secretary-general, said NTUC, he advocated for change and pushed for initiatives that later became tripartite and national policies, including skills redevelopment, progressive wages, and individual and collective representation of professionals, among other things. Union membership also grew from 500,000 to over 850,000 under Mr Lim, after he pushed to include workers of "all collars", "all ages" and "all nationalities" in the 2000s. This helped to address potential divides caused by the ageing workforce, widening income gap and greater dependency on foreign manpower, added NTUC. In a statement released yesterday, the NTUC Central Committee also expressed its deep appreciation to former NTUC secretary-general Lim Boon Heng "for his astute stewardship and thought leadership" as NTUC trustee and at NTUC ARU's trustee board, after Mr Lim Swee Say took over his roles. It should come as no surprise that in explaining his philosophy on helping workers, retired manpower minister Lim Swee Say would refer to a horse and a river. Mr Lim, 63, known for his ability to crunch economic concepts into memorable catchphrases, said: "I've told workers frankly, and I have told them a few times: 'Look, we can bring a horse to the river, but we cannot make the horse drink from the river'." What he meant was that the Government and labour movement "must do everything we can", but workers must meet them halfway, he explained. "If there is no river, we need to create a river. But at the end of the day, we need the workers to play their part and put in the efforts to take on better skills and better jobs," he said in an interview published yesterday in LabourBeat, a blog run by the labour movement. The former NTUC secretary-general has been given the highest honour at the May Day Awards this year - Distinguished Comrade of Labour. Among his contributions, he was credited for the pivotal role he played in helping workers weather two financial crises. He was put to the test soon after joining NTUC, as the Asian financial crisis occurred in 1997 and about 29,000 workers were retrenched in that one year - "a shock" to the labour movement, he said. That was when NTUC realised there were limited avenues of support for retrenched and unemployed workers here at the time, he added. The crisis caused a "fundamental shift" in the way the labour movement looked at skills development, and it started to put in place skills certification and employment support systems. "I would say that it was a defining moment not just for me as a newcomer, but even for union leaders who had been in the labour movement for some time." By the time the global financial crisis of 2008 hit Singapore, the Employment and Employability Institute and Workforce Development Agency, now known as Workforce Singapore, was ready to help retrenched workers retrain and find employment. "More importantly, tripartite partners were able to rally together very quickly, learning from what we had gone through during the Asian financial crisis." 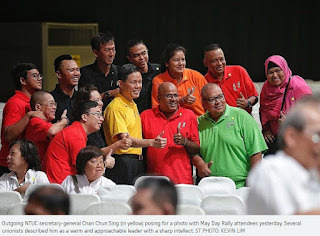 Mr Lim also recalled in his interview with the blog how his experiences growing up in the 1960s shaped his belief that a job is the best welfare, and full employment is the best protection for workers. It was common to see people struggling to find jobs and it was his boyhood dream simply to have a good job. "In my case, my dreams came true and now helping workers is something close to my heart," he said. Even so, joining the labour movement in 1996 was a wake-up call for him, he recounted. In one of his first encounters with union leaders, he spoke about how Singapore had come a long way and cited the fact that per capita income had reached $24,000 a year at that point. Before he could complete his sentence, a union leader told him that such statistics did not matter to workers, who would just ask: "Where is my $24,000?" Mr Lim said this encounter made him realise that it was important to translate Singapore's overall success into progress for the individual. "In other words, yes, we can talk about how well we have done as an economy, about how well we have done to raise incomes, but at the end of the day, we must ask ourselves: What does it mean for the individual?"